Split ends are one of the major problems of hair. It is important that you get your split ends trimmed regularly. Make it an integral part of your hair care routine. This way you can keep your hair healthy. Split ends can really affect the look and health of your hair. Below are given some of the simple facts related to trim split ends. Trimming Split Ends – Why is it Important? Split ends just do not stop! Split ends just do not stop. They can split into 2, 3 or even more. This way they reduce the length of your hair. Split ends can affect the growth of your hair. It can restrain the growth of your hair. So, it is very important that you trim the split ends. Never be careless about split ends. They can split more and more and spoil the look and beauty of your hair. When you have split ends, your hair tends to look dull and lifeless. Even if you spend a lot of money on hair treatments, hair masks, and spas, they will not make your hair look good. Your hair will still look dull. Split ends look dry and brittle and also ugly. This can spoil the beauty of your hair. But once you trim your split ends, you can see that your hair has become more healthy and shiny. Anyone will notice it. So, instead of spending a lot on your hair care routine, you can get beautiful hair that is healthy, within minutes. If you have taken notice of your split ends, you will see that they do not look similar to your natural hair colour. Split ends are usually lighter in colour. They are also uneven and have a different colour than your normal hair colour. This spoils the look of your hair. You will see that your hair colour is uneven. It looks discoloured. Soon after you trim your split ends, there is a great difference in the colour and quality of your hair. Hair care treatments can repair split ends: This conception is not true. You can never treat split ends with any hair care treatments. All that you need to do is to trim them and maintain your hair in such a way that no splitting of hair occurs in future. The sooner you trim your split ends, the better it is for your hair. So, trim your hair today itself. Remember to trim your hair regularly. This way you can avoid split ends. Trimming split ends does not make your grow hair faster at all. If you thought that trimming the split ends makes your hair grow fast, you are mistaken. It helps in improving the health of your hair and also promotes hair growth. This is because cutting off the split ends prevents the hair from splitting further. This way the health of your hair is ensured. As a result, your hair starts growing longer as well as stronger. Make sure that you moisturize your hair regularly. This is very effective for preventing split ends. Every time you shampoo your hair, remember to apply conditioner on your hair. If you have dry hair, use conditioner that contains natural oils. For oily hair use a light conditioner. Apply olive oil or coconut oil often on your hair. This helps in sealing the moisture of your hair and preventing your hair from getting dry and giving rise to split ends. Put your hair up. You can tie a bun or pin it up. This way you can protect the hair ends and prevent split ends. Styling your hair excessively is also not good for your hair. Hair straightening, blow drying, brushing hair when your hair is wet, all these can lead to split ends. Trimming Hair Benefits – When trimming is necessary? Do you know what extreme feathering is? If you grab your hair at the base or root and glide your hair down to the ends and notice that the diameter of your ends is very thin compared to the roots of your hair, this means that your hair is experiencing extreme feathering. It is natural that some feathering is there, especially if you are wearing your hair down all the time. But if there is huge difference, make sure that you trim your hair. Frequent and direct heat on your hair strands from tools like hair dryers, curling/flat irons, straightening combs etc can strip off the sebum or the natural oils in your hair and make them dry and highly susceptible to split ends. The ends of your hair are the oldest parts of your hair. So, you should treat the hair ends well. They need more attention and care. Lack of sealing ends can cause split ends and hair breakage. Especially women with tight curls often have split ends because the curlier your hair is, the more difficult it is for the natural oils to run down to the ends of your hair. 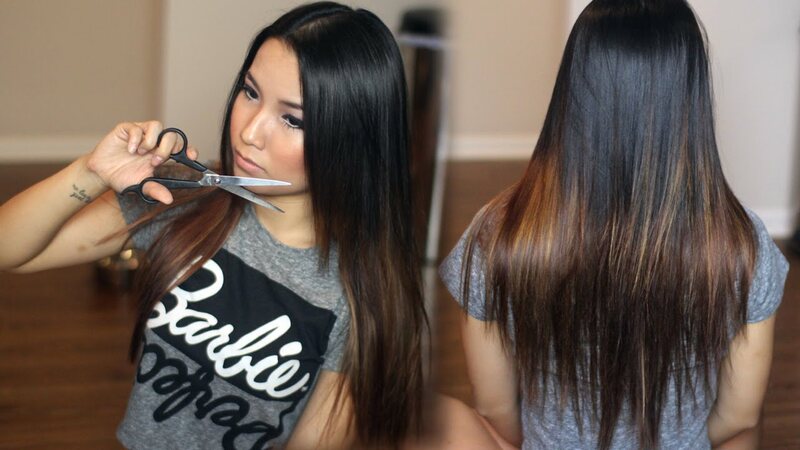 If when you have straight hair, it is easy for the natural oil to reach the ends of your hair. So, make sure to seal the ends of your hair. This can keep a control on spilt ends. 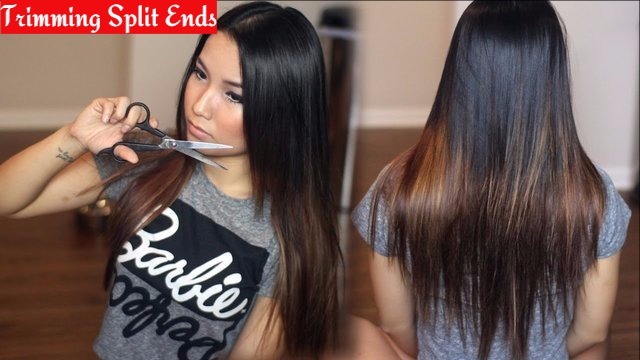 If your hair ends are just snapping off or if your hair breaks easily when you detangle your hair, then it is necessary that you trim your hair. If your hair is prone to dryness in spite of conditioning and sealing, then trimming is essential for keeping your hair healthy and beautiful.